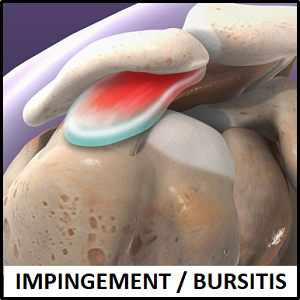 The term shoulder impingement or bursitits refers to the irritation of your sub-acromial bursa. Bursa are thin fluid filled sacs that are present throughout the body, and their primary purpose is to decrease friction between structures. There are many bursa around your shoulder, but the largest is called the sub-acromial bursa. When this bursa gets irritated, it can become inflamed. It can be painful because there are thousands of nerve endings in your sub-acromial bursa that send pain messages to your brain. The sub-acromial bursa can get irritated and inflamed for a number of reasons. This includes falling onto your shoulder, instability of your shoulder or shoulder blade that causes movement of the structures around the bursa, or compression of the space between the acromial arch above the bursa and the humeral head below the bursa. There is much discussion in the literature at present as to whether bursitis is actually caused by the impinging of the bursa between the acromial arch and the humeral head, and so the term ‘impingement’ is falling out of favour with some clinicians. It is however as easy way to understand how the bursa can become injured and so may be a useful conceptual idea for bursitis. Bursitis in your shoulder usually settles down when it is no longer being irritated. It is useful to think of this problem as the result of other problems in your shoulder, rather than the cause of your problems. Steroid injections can be administered to decrease the irritation of your bursa, but without addressing the underlying cause of the bursitis, the bursa can become irritated and painful again. Additionally, the administration of steroid can have harmful effects to the other structures around your shoulder and so should only be used if absolutely necessary.